The ‘MPC Touch Bible: 2.0 Edition’ is the complete guide to the MPC Touch running MPC Software 2.0, packed with practical, 'hands-on' beat making projects that teach you everything from core beginner's concepts all the way up to advanced power-user techniques! Plus many, many more pro tips, tricks and shortcuts! 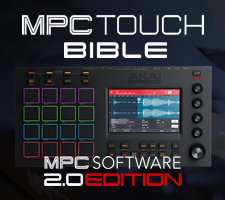 The ‘MPC Touch Bible’ is without doubt the most complete and essential resource for all MPC Touch owners - available to download instantly after purchase! I bought this tutorial but I am running 2.3. There are inconsistencies in the tutorial that do not match what appears on the screen. An update needs to address this issue. Hi, this MPC Touch book never really sold, it seems most people have the Live/X these days so I'm not sure what the plan is regarding further updates. Most likely combine both books in some way so we have just one 'touchscreen' bible. What I can do is send you a copy of the MPC X/Live Bible which is currently at 2.3. If you'd like this, message me with your order details and I can sort that out for you. I just sold my Ren and bought a MPC Touch and upgraded to 2.4. Considering the above comments should I just buy the Live/MPC X Bible? I don't have any immediate plans to update the touch Bible, so yes, the MPC X/live bible is the best option if you want the most up-to-date content. I'm looking for more of an MPC Touch Koran. Anyone?